Why cut your own tree? It’s a good way to experience the countryside and support a local family farm. The trees are recyclable and sustainable, rather than made from oil-based petroleum products. The smell of fresh pine instantly creates a holiday atmosphere in your home. Just be sure to measure before you go! When deciding on how tall of a tree to get, remember to add an extra foot to accommodate your tree stand and the tree topper. The space for your tree should be almost as wide as it is tall. Most farms provide the tools to cut down a tree and tie it to your car. Here are some of our favorite farms in the Chicago area. 7719 Ryan Rd. A tradition for over 25 years. 8 varieties of Hand pruned, organically grown firs, spruces, & pines. Thousands of trees to choose from on our 55 acre farm! Free horse-drawn wagon rides & Santa on weekends. Pets welcome! 850 Butterfield Rd. We offer three seasons of fun for all: produce in the summer, pumpkin daze in the fall and Christmas trees in the winter. Cut your own Christmas tree or buy from pre-cut trees along with wreaths and bakery items. Open the weekend before Thanksgiving through Dec. 23. 23882 Payne Rd. Get your fresh and local tree from an Illinois family farm that’s been open every winter since 1956! 38614 N. Fairfield Rd. 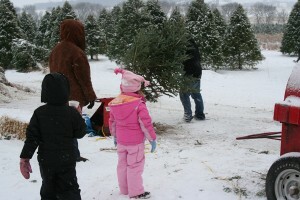 A limited supply of cut-your-own trees with pre-cut trees and wreaths. Open Fri.-Sun. from late Nov. through the weekend before Christmas. 4614 Pioneer Rd. Selling cut-your-own Christmas trees since 1973 with a variety of pines, spruces, cedars and firs. Our trees are organically grown and pruned by hand. Handcrafted holiday items are available for sale in the warming house. 24774 Petite Lake Rd. Veterinarian Ed Sullivan has owned this family farm since 1974 and has been selling trees on weekends in December for 16 years.